I am not now a professional photographer, nor do I profess to being an expert on the subject. That's not to say I don't have some knowledge that is worth sharing, but I'll let you be the judge of that. If you are curious about my background and why I would presume to teach a photo class I invite you to visit my web page and follow the links on the introduction page. This tutorial exists because in 2001 members of the ph-photo@yahoo.com newsgroup where I regularly posted photo tips asked me to conduct class with a live model. Kodak Philippines and the Center for Creative Computing agreed to sponsor the class, so I felt obligated to produce a decent handout. Unfortunately it had to be put together on short notice with the limited number of digital photos I had on hand plus some hastily produced makeshift "studio" shots to illustrate what I demonstrated with a live model in the class. The main point of the class was to illustrate that it doesn't take a lot of expensive camera and lighting equipment to take decent pictures. I was living proof, since I had long ago abandoned my bulky Mamayia 645 medium format and 35mm Nikons for the convenience of a Pentax WR-90 zoom point and shoot, then abandoned film altogether in favor of a rudementary but affordable Kodak DC290 digital. The first part of the class focuses on basic skills all photographers need to take good pictures, regardless of technical sophistication and equipment: how to compose and crop a photo in the viewfinder and how to light and pose individuals and groups. The goal is to keep things simple via easy to remember rules. Most in the class had not yet made the move to digital so the next part of the class was an introduction to digital photography with and introduction to editing, sizing and printing using Adobe PhotoShop. Technical aspects such as shutter speed, aperture, depth of focus, etc. were not covered because of time constaints and the fact the people in the case either were using point and shoot cameras , or were knowledgable 35mm SLRs users already familiar with these concepts. 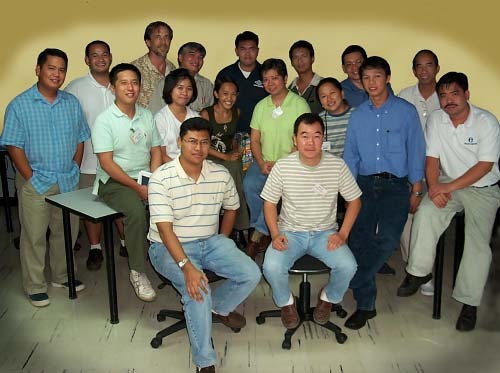 After teaching the initial class I was invited to repeat it at Philippine Graphic Expo in June 2001. Since the target audience for that venue was primarily designers and prepress professionals I added sections on color management and reproduction, things I deal with daily in my day job as a printing manager. Thus what is contained here is a bit of a hodge-podge, but hopefully you will find something of interest which will either enlighten or encourage you to explore the net for additional information. I've provided a list of links on the last page. Goto super.nova.org my home page.